Parking.com offers convenient parking near many theaters in Chicago. Parking discounts and online pre-purchases are available for select locations. Choose from the list below for more information on parking or to reserve a guaranteed space. Don’t forget to download the free Parking.com mobile app for directions to the garage or to bring your mobile coupon or parking pass with you. Whether you’re a visitor or a local, when in Chicagoland, you must stop by and explore Chicago’s Downtown Theater District. 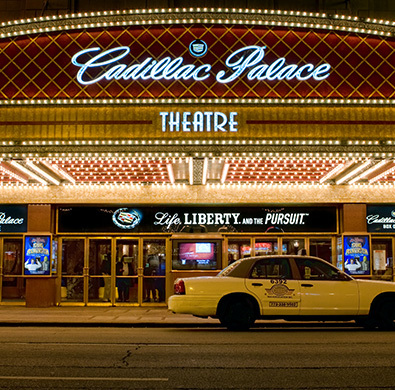 The stages of the Cadillac Palace Theatre, James M. Nederlander Theatre, CIBC Theatre, Auditorium Theatre, and Broadway Playhouse often host touring theater productions and world premieres of Broadway-bound productions such as Tony Award winner Hamilton and the popular Blue Man Group. Prefer to watch local talent instead? Chicago has plenty of production groups such as ComedySportz, Lookingglass Theatre Company, and Steppenwolf Theatre Company offering plays, musicals, comedies, and dance that entertain and electrify audiences. As a popular stop for touring singers and artists, Chicago theaters also host concerts and special events. With so many shows performing, it’s easy for Chicagoans to be entertained year-round!